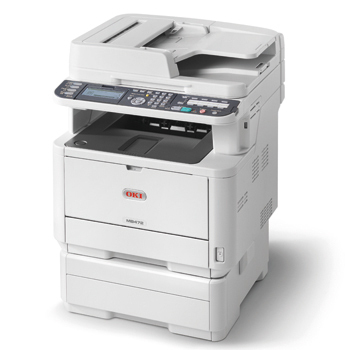 The MB472w from OKI® gives you all the functionality, reliability and productivity features you want – including wireless LAN. 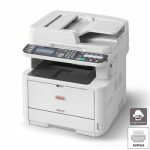 Everything the small workgroup requires – The MB472w from OKI combines black & white printing, copying, faxing, and color scanning. This affordable, professional wireless multifunction printer with a print speed of 35 ppm1 doesn’t compromise on performance or print quality. Easy to use, it has a 3.5″ graphic display, intuitive menu system, and a QWERTY keyboard to simplify data and email address entry. Choose the toner capacity to suit your business needs: a standard 3,000-page cartridge or high-capacity 7,000-page cartridge with lower running costs. 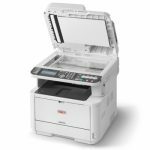 Sharing files and documents is a snap – Place your document on the flatbed platen or in the 50-sheet duplex reversing automatic document feeder (RADF) and USB- or network-TWAIN scan it in color or black & white to your PC or Mac. Save and send the electronic version to a folder on your PC, the network, or FTP site, as an attachment to an e-mail address or as a fax. LDAP provides direct access to contact and email data from an existing directory server, saving time and improving the reliability of document delivery. The Job Build function enables a number of different documents to be scanned, creating a single document for output. The MB472w also offers robust fax features, including Internet (T.37) faxing, one-touch dialing, distinctive ring, and an Auto Delivery feature that routes all incoming faxes to a folder or to specified e-mail addresses. Printing wirelessly and on the go – The MB472w has USB 2.0, 1 GB Ethernet interfaces and is Wi-Fi CERTIFIED™ a/b/g/n standard. 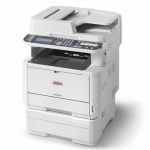 It supports cloud/ mobile solutions such as Google Cloud Print™, AirPrint™ for Apple iOS and OKI Mobile Print app for Android® devices. Further enhance your productivity – The MB472w has a Job Macro function (accessible right on the operator panel) that records and instantly recalls frequently used tasks and settings —automating them for increased productivity and efficiency. 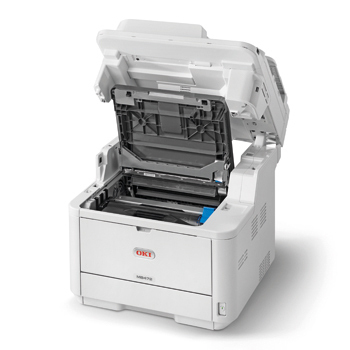 Energy-efficient operation – To help control costs, the MB472w comes with duplex (2-sided) printing/ copying standard, so you save paper and energy. It features energy-saving Deep Sleep mode—which reduces energy consumption to 1.9 watts or less! It will even shut itself off after a period of inactivity (adjustable to 24 hours)—so you pay even less on energy costs. And, for ongoing savings, the 2-piece consumables configuration lets you replace just a toner cartridge when you need to, instead of the toner cartridge and the image drum. Backed by legendary support – If you need technical assistance, you can speak to a live expert located in North America by calling 800.OKI.DATA (800.654.3282).3 That’s 24/7/365. The MB472w Mono MFP from OKI: the perfect mono MFP for your desktop applications—fast, full-featured and environmentally friendly.